Payal Shah is an amateur painter, a brand strategist and a professional pajama collector. Heading the Creative & Market Intelligence at Happy Thinking People-Asia Pacific, her approach to innovation and strategy is to help brands move beyond short-term solutions to position themselves for growth and sustainable market leadership. With an innate curiosity about human behaviour and a keen ability to translate insights into leading business solutions, she purposefully chooses to work across categories as a means to fuse divergent thinking and practices in unexpected ways. 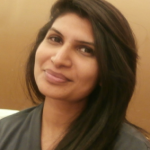 Payal specializes in Consumer Insights & Brand Strategy focusing on building intelligence within the organization. She has worked globally across several categories including FMCG, pharmaceuticals, fashion & retail. Few of her clients include Pernod Ricard, Colgate Palmolive, and Unilever. A strong believer in side projects, she is the Organizer of CreativeMornings Mumbai Chapter and a Brand Strategy Mentor at Ecole Intuit Lab, Mumbai.